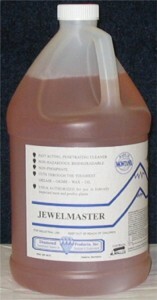 Jewelmaster is the latest in safe and effective cleaners designed with our environment in mind. It contains natural solvents, and detergents that are biodegradable and mild to use. Jewelmaster is relatively neutral, contains no harsh acids, alkalis or solvents. It does, however, penetrate deeply imbedded grease, oil and dirt to dissolve it away. Can be used with hot or cold water. Care should be taken when used on some type of plastic or vinyl as the solvents are very aggressive toward some types of plastics. Always test on an inconspicuous area.